Published in the South Kent Gazette, 3 October, 1979. At the Restoration, Captain Taverner retired from public life. In those days there was something real in the cry for religious liberty. Captain Taverner could not be allowed to worship God in accordance with his conscience, unmolested, for in the year 1670, he and Richard Matson, Edward Dell, Nathaniel Barry, Simon Yorke and Anthony Street, all prominent Dover men, were summoned to attend the Privy Council and reprimanded for attending Conventicles, and the Dover Corporation were ordered to seal up all such places. Taverner did not submit tamely, and the result was he spent some time in prison at Dover Castle, but after his release he was accepted as pastor of the Dover congregation. At that period their usual meeting place was closed, and Taverner retired for some time to London until he could safely return and exercise his ministry. In 1692 he obtained a licence for the south-west end of his dwelling house in Market Lane to be used as a meeting house, and he there ministered until his death in 1696. Captain Taverner gave to the Baptist congregation a piece of land adjoining the meeting house for a burial ground. It was land which had, no doubt, belonged to St Martin’s Church, but, like other parts, it had been let or sold by the Corporation for private purposes. The Baptist congregation continued to meet in Captain Taverner’s house until 1745, when, greater religious toleration prevailing, a chapel was built in the middle of Market Lane, on the west side, and continued to be used until the General (Unitarian) Baptist Chapel was built in Adrian Street. On another stone was this: “Under the tomb near this wall lieth the bodies of Captain Samuel Taverner and his wife Susanna, and his son Samuel; and in a vault on the north side of the said tomb lieth the bodies of Mr James Redding and his wife Priscilla, who was one of the daughters of Captain Samuel Taverner, and also the bodies of Mr Sampson Pierce and his wife Susanna, who was one of the daughters of the said Mr James Redding, with several others their respective sons and daughters, who at several periods departed this life from the years 1683 to 1786. Also James Pierce, who died 11 April, 1791, aged 77 years.“ Mrs Peirce, the wife of James Peirce, established on these premises the first Sunday school in Dover. The churchyard stood near where the access road to Durham Hill leaves the York Street dual carriageway, the building of which led to the clearance of the old burial ground. On the south-east corner of Market Lane stood an old stone building supposed to have been originally associated with the Monastery of St Martin-le-Grand. In the year 1552 the ancient almshouse from near Townwall Street was transferred to these premises, which continued, under the old Charity, to be used as a Seamen’s Hospital until about 1887 when the old building was sold to the late Sir Richard Dickeson, and the funds were transferred to the Dover Hospital, with the liability to keep a certain number of beds for seamen. For many years Market Lane was a place of commercial importance. The premises of Messrs Richard Dickeson and Co., which traced its origin as far back as 1649, had branches in almost all the principal garrisons of the British Empire. During the Kaiser War the business was taken over by the Navy, Army and Air Force Canteen Board and at the end of hostilities the premises were vacated. The big building stood empty for several years and eventually was divided up for several businesses. Part, in Queen Street, became the home of the Central Gospel Hall. For many years Warren and Reynolds, wholesale grocers, occupied premises in the lane. The last business premises in the lane are those of the "Prince Regent" public house which stands on the corner but faces the Market Square. Stepping over Queen Street into Last Lane, we are still on historic ground. On the east side of this lane appears to have been an ancient Saxon burial ground, and in recent times, during some excavations for new buildings, Mr James Binfield came upon several interesting relics. This lane was just inside the original town wall as it existed before A.D. 1370, and there is no doubt but that its slightly elevated and central position made it a good business thoroughfare in olden times. For the reason that Last Lane never had to be widened, and seldom needed to be mended, there is very little about it in local history. Although a lane of business marts, it was really in the country, the land above it and to some extent below it, being cow pastures, and, with the exceptions of the buildings that lined it, there were few habitations in this locality until about 1757. 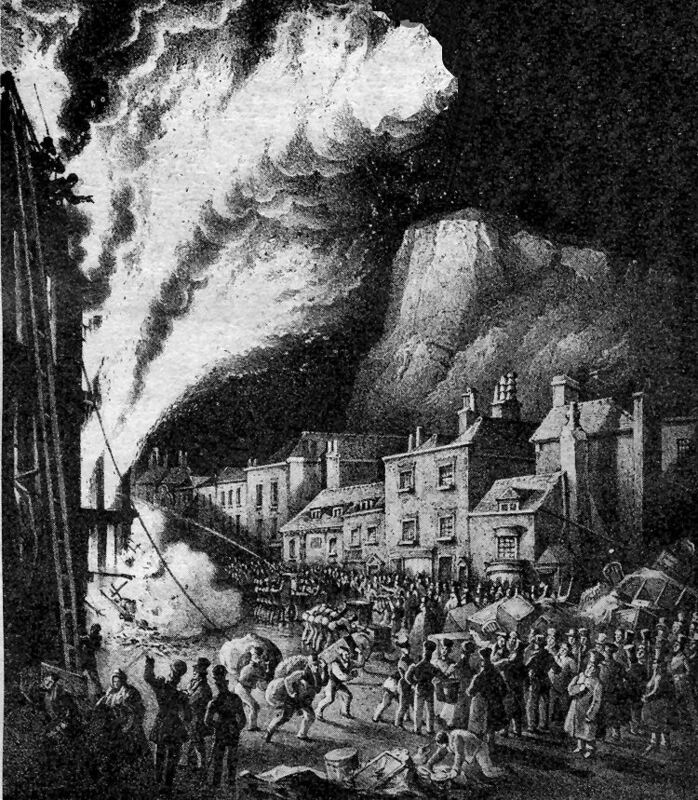 Fire-fighting in Snargate Street in the reign of William IV. The picture, based on an original water colour and engraved by William Heath, was first published by Thomas Rigden in June 1837, a little over a month after the fire in Magnus’s clothing shop on 11th May that year. The building was almost opposite the entrance to the Grand Shaft spiral staircase. William Heath dedicated his drawing to “the officers and privates of the Royal Artillery, the 2nd Batt. of the Rifle Brigade, the Mayor and such of the inhabitants who, by their prompt and efficient exertions, arrested the progress of the conflagration“ which might easily have swept along the length of the street.